A while back, my friend, Grace Margaret, an experienced knowledgeable gardener, mentioned that she had trained her container-planted duranta into a tree. My response was an incredulous, "Really. What's a duranta? Why and how did you train it into a tree?" When she showed me her lovely, purple, flowering tree with its oval orange berries, I was captivated and needed to know more. A rapid-growing, small evergreen spreading shrub, Duranta erecta usually grows to 12 to 15 feet. Occasionally, it will grow to a 20- to 25-foot tree in hot, humid areas. It is a member of the Verbenaceae family and can be called 'Sapphire showers,' Duranta repens or Duranta plumieri. As a tropical, root-hardy perennial plant, it blooms all year long in the U.S. Department of Agriculture Zones 9-11. 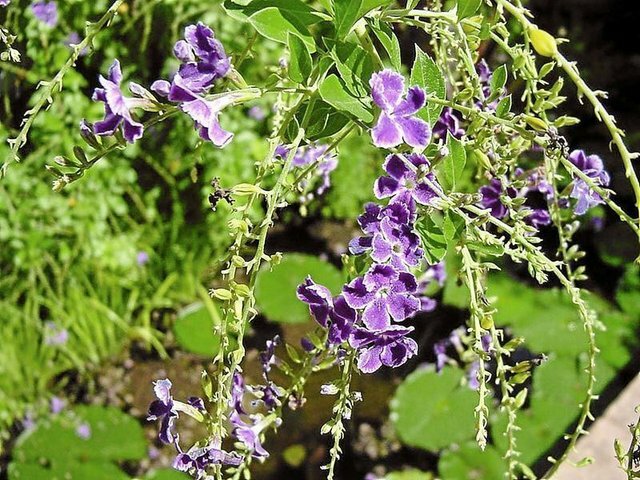 In other parts of Texas, the duranta is considered an annual or tender perennial. Easy to grow and drought-tolerant, the duranta attracts bees, butterflies and hummingbirds - as well as deer. 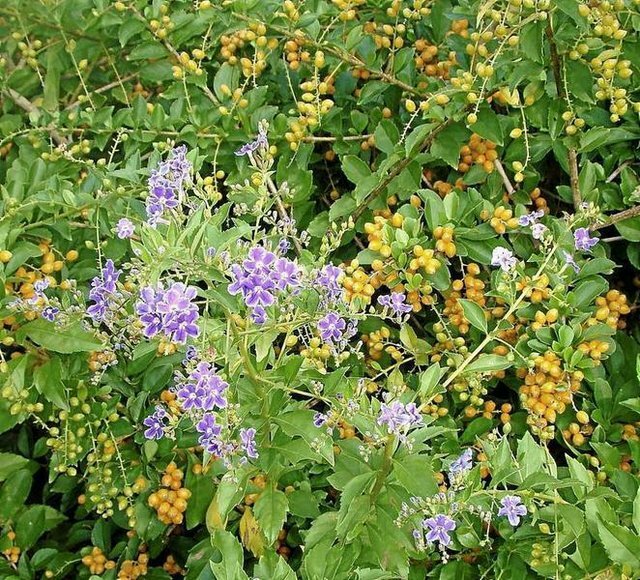 Duranta has long sprays of small, light blue to bright purple flowers at the tips of its drooping branches and can fruit heavily with long-lasting, small, teardrop drupes that mature into a golden yellow to deep orange color and contain a single seed. Its leaves are thin, pale green and smooth textured, shiny and glossy. The duranta has sharp spines that require cautious handling. The duranta erecta needs a well-drained, slightly acidic to mildly alkaline soil and blooms prolifically in full sun. While it will tolerate partial shade, it will not bloom as profusely nor produce as many berries as it does in a sunny location. The 'Gold Edge' Duranta, known for its bright yellow variegated foliage, prefers a shady environment and has few flowers. According to Wayne and Martha McAlister, Duranta is often planted in pots or clustered on the south-side of homes and buildings in Victoria. 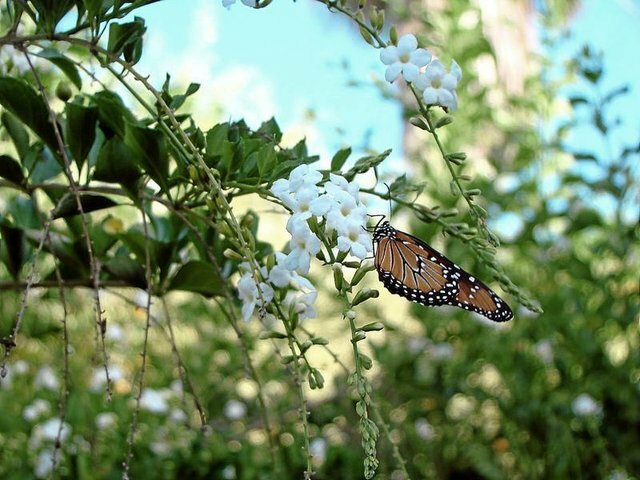 The white duranta is often planted near dark green shrubs or plants like roses to provide interest and color in the garden. Once the plant is established, it needs to be watered weekly or when the plant is slightly dry. To keep the foliage a healthy green, fertilize with a slow-release organic fertilizer every three to four months. 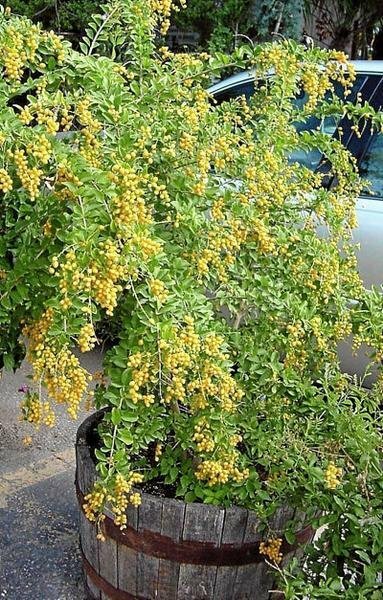 Duranta - 'Brazilian Sky Flower' was recognized as a Texas Superstar annual in year 2006. According to Dr. Jerry Parsons, who was instrumental in starting and developing the program through Texas A&M AgriLife Extension Service, this duranta meets all six criteria for the prestigious Superstar designation. It is attractive and can be grown by many types of gardeners. It has unique ornamental characteristics not common in other nursery plants. It performs consistently in all areas of Texas, although its hardiness and size varies depending on USDA zone. The more tropical the area, the larger and longer it blooms. It is considered a summer annual in Zone 8 or colder areas. In Victoria, Parsons describes the duranta as a "6- to 8-foot-tall summer annual, an herbaceous perennial or dieback shrub depending upon the severity of the winter temperatures." It is easily propagated from seeds in the spring or from greenwood cuttings. It is container-attractive and appealing to consumers. Grace Margaret said that she loved the look of the duranta with its cascading purple clusters of flowers and its contrasting orange berries. However, to maintain the beauty of this large, sprawling shrub and grow it in a container, she needed to reshape it. So she found the two or three main stalks and trimmed the excess branches to encourage it to bloom at the top. Margaret advised regular pruning as well as clipping tops to encourage bushy, thick flowering foliage. If you are looking for a colorful addition to your yard, why not try a duranta? If you don't have room in your yard, consider pruning it into a container tree like my friend did. As a Texas Superstar plant, you can find several varieties of duranta at local nurseries in Victoria.